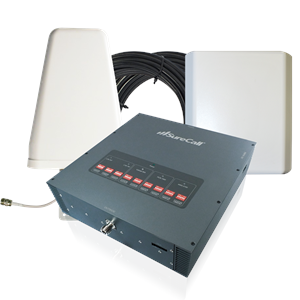 The Force5 quad band combines PCS and Cellular dual-bands with LTE and AWS frequencies for Verizon, AT&T and T-Mobile for a complete 2G-4G voice and data reception solution. SureCall Force 5 five bands wireless signal booster kit boost 3G, 4G, LTE data signal and also deliver clear voice signal. Cellphone-Mate Fusion5 amplifier is ideal for commercial buildings, hospitals, corporate and educational campuses. FCC certified. SureCall Force-5 cell phone signal booster is an alternative solution to DAS but at a fraction of the cost. Modular in design, each Force-5 provides enhanced voice and data reception for areas of up to 80,000 square feet with over 100 users.